Digital Forsyth | Wake Forest homecoming celebration, 1963. 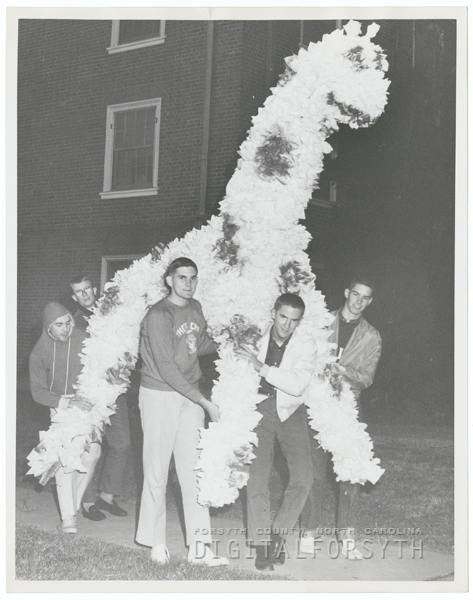 Home › Photos › Wake Forest homecoming celebration, 1963. Wake Forest homecoming celebration, 1963. Wake Forest homecoming celebration, 1963. This is the Theta Chi Fraternity. The “homecoming float” shown was suppose to represent a Gamecock! If I remember correctly a Demon Deacon with an axe was also suppose to part of the float, too. The float was located on campus in front of the Theta Chi residence hall. I believe I recognize two of the five Theta Chi guys. Greg Stett is in the foreground with white jacket and John Haverkamp, wearing glasses is at the rear. I’m not sure about the other three, but I think the tall guy in the front is Bill Dorman. Yes that is me in the foreground. I usually supervised Homecoming floats and decirations we had at our frat house. That’s Bill Horton in the back from Ashville. John Haverkamp was my roommate and has since become a doctor in NC. Thank you for adding names, which I will add to our photo database. The man at the far right remains unidentified.